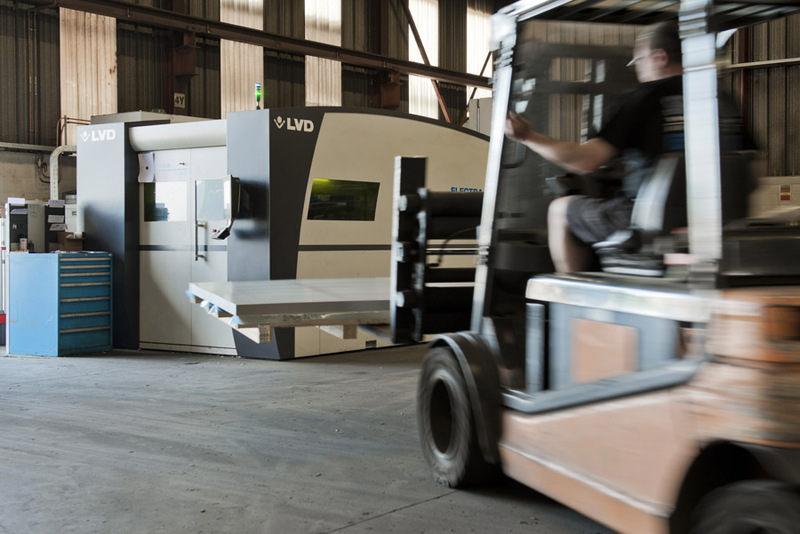 By: Kurt Debbaut, Cadman product manager, LVD Co.
Hayen Laser Technology (HLT) is a busy fabrication shop specializing in laser and waterjet cutting, bending, welding and finishing. Founded in 2006 in Zepperen, Belgium, the company supplies precision parts to the automotive, construction, electronics and petrochemical industries. As it’s grown, HLT has made investments in systems for sales, purchasing, invoicing and production. From its beginning, Hayen Laser Technology’s (HLT) growth has been strong, due in part to the company’s commitment to continually invest in advanced fabrication technology. There was never a question of integrating these systems until the effects of having “unconnected” processes began to impact the shop’s competitiveness. 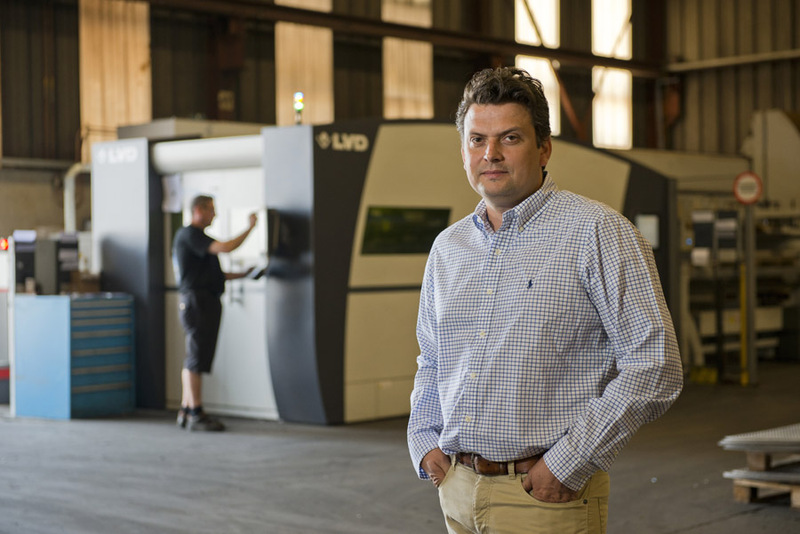 While HLT continued to invest in advanced fabrication equipment (recently adding a high-speed LVD Electra fiber laser cutting machine), streamlining and automating its production was only part of the equation for its success. A bigger picture perspective was needed, so Hayen looked into linking the processes. The first step: adding a resource planning (ERP) system. The second step: integrating the ERP system with the shop floor via LVD’s Cadman software suite. By connecting its processes, HLT was able to optimize procedures. The benefits could be seen across the business – from the office to the shop floor. In the front office, efficiencies were widespread. HLT meets high-accuracy part requirements for steel, stainless steel, aluminum and brass parts using three laser cutting machines, including an ultra-high-speed LVD Electra fiber laser. “Before, six employees had their hands full writing quotes and compiling assignments for the CAD department,” Hayen says. “But now, one person can finish that work. There is much less paperwork, and nothing is done twice. The biggest gain is that we can now take on much more work and deliver faster. On the shop floor, efficiency gains are also significant. A reduction in employee stressors is an added benefit. “Automation of the work preparation process as well as nesting in 2-D and creating programs for 3-D pieces significantly reduced stress on the shop floor,” Hayen says. “Flow and throughput times have drastically improved. Overall, the company has experienced an increase in the accuracy of cost estimates and more efficient bundling. Additionally, the process of sorting and validating cut parts has also improved. In terms of accurate cost estimates, Hayen attributes the interconnectivity between the ERP system and the Cadman system as a major factor for improvement. An icon-driven touch control on the Electra fiber laser machine reduces the learning curve for operators by providing an easy-to-use interface for even the most complex applications. The times forwarded by the machine for quotations are estimates based on past jobs. The access to this historical data has been key. In terms of bundling and sorting activities, LVD’s Cadman-Job has made organizing production much easier than before. It’s also aided in the company’s efforts to reduce scrapped material. 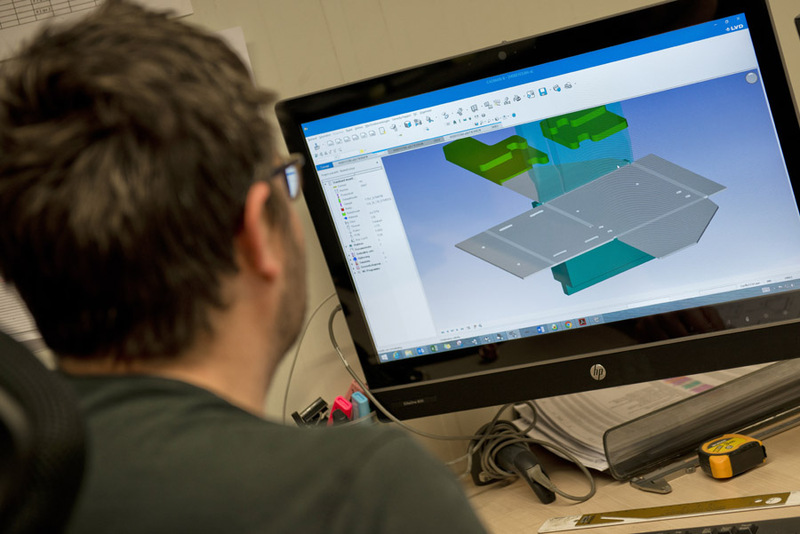 The software also allows HLT to run through the status of every order, including the delivery date for the piece in both its 2-D and 3-D forms. It can filter dates in various ways in order to bundle jobs. After cutting, parts are moved to the machine table or unloading pallet for sorting. 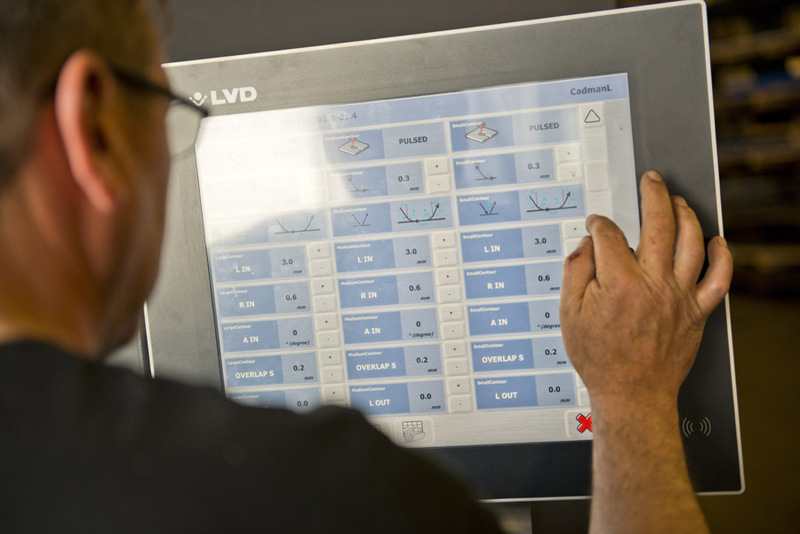 LVD provided a sorting function for this operation, which is controlled from a Touch-i4 tablet. The tablet provides information on the various production orders in the nesting process, such as the number of pieces, the project they belong to, the position in the nesting and the following operation. After importing a 3-D CAD part, Cadman-B software calculates bend allowances and determines the optimal bend sequence and gauge positions. The software offers a simulation environment that visualizes the bend process with start-to-finish collision detection. The same tablet can also be used to assign the parts to a location or carrier during the sorting process. This allows HLT to integrate external operations into Cadman, such as tapping, brushing and spraying. For HLT, success translates into a fast-growing order flow. This year, the business complex is expanding by 2,000 sq. m, its production is at its highest and its workforce is growing. Overall, the company has freed up capacity to continue to grow. But, the integration journey is not over. The company’s next steps include linking to inventory and setting up a web portal where customers can enter their orders. “When we receive an order, I’d like to use the LVD software to see an overview of what is needed and what orders I need to place with my supplier,” Hayen says. “And then afterward, I’d like to be able to see what material was actually used. 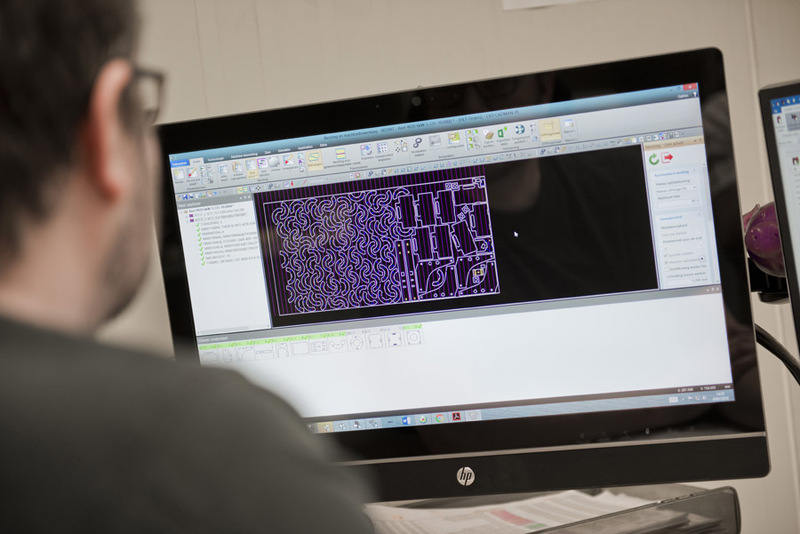 HLT has the flexibility to manually or automatically nest laser parts using Cadman-L laser cutting software. The software imports unfolded flat parts, then nests and processes them automatically to the production order.